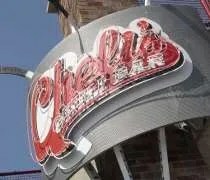 Cheli's Chili Bar & Restaurant in Dearborn. Since moving here, I’ve been wanting to eat at Cheli’s Chili in downtown Detroit. I’ve always been a huge Chris Chelios fan and a #7 Blackhawks jersey still hangs in my closet. When I started looking at restaurants in Detroit, Cheli’s Chili on the corner of Michigan and Oakwood came up. I knew my parents would like a sports bar. J had a great idea when it came to entertaining my parents. Our original plan was to go gambling in Windsor, but my parents forgot their birth certificates so we couldn’t do that. I offered Detroit, but neither were really interested. They usually stop in New Buffalo when they come see me, but mom wants to say she gambled in Canada before the Western Hemisphere Travel Initiative goes in to effect in June. Since they forgot their documents, we needed a plan B. I had no ideas, but J suggested The Henry Ford Museum in Detroit. First, we needed lunch. We made it to Dearborn just before noon. The building is on the corner, but the entrance is actually in the back. There’s a parking lot there with a few spaces, a public lot right next to it and street parking all along Oakwood. We parked the car and walked towards the door to find another couple standing there waiting. The restaurant didn’t open until noon. No big deal because it was 11:55. We ended up walking across the street to Westborn Market (review HERE) to kill time. 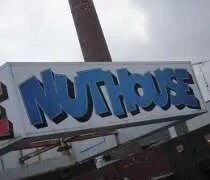 The Nuthouse Sports Grill on Michigan Avenue in downtown Lansing. Over the last few weeks, you’ve heard me talking about “one year.” Today is actually an anniversary. It was one year ago today that J and I were in town for the first time together. She had flown in for an interview back in February, but it wasn’t until March 17 that she was actually offered a job. She and I were in Chicago because we had just gotten back from Bristol, TN and decided to take a few more vacation days. While we were at her parents, she got the phone call offering her the job. Since we were two hours closer, we thought we’d best take a trip to our new home to find an apartment. After signing a lease, we needed to find lunch before that long drive back to Peoria. We had been on the road all weekend. We actually slept in a different state every night for five straight nights. Illinois, Tennessee, Kentucky, Illinois, Michigan. It was kind of a whirlwind weekend topped off by my brother announcing he and his wife were having my parents first grandchild followed by me announcing I was moving with my girlfriend to Michigan. We ran the gamut of emotions. Before I started dating J, I never expected to leave Peoria. I was happy enough with my job. I didn’t love it, but it paid the bills and I don’t like moving. J had an opportunity come up here that we couldn’t pass up. I didn’t want to be five hours away and my career was going nowhere where I was at, so it was time for a change. We drove downtown that first day looking for something to eat. The first thing that jumped out was a sports bar across the street from Oldsmobile Park. We both like sports bars so after a few more minutes of exploring, we headed back to the Nuthouse. Since we just made a quick trip to Chicago for a birthday party, we really didn’t have time to drive to my parents for any length of time. I had something I needed to give my brother and my mom had some things for me, so we decided to meet in Matteson, IL for lunch. Our first choice was Nino’s Pizza, but it was closed. Then we tried Baker’s Square, but it had gone out of business. On the way in to town, I noticed a sports bar on Lincoln Highway. I called my dad and told him to meet us there. You can never go wrong with a sports bar. 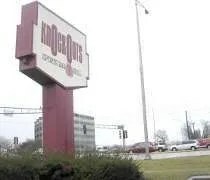 Knockouts is on the corner of 211th (Lincoln Highway) and South Cicero in Matteson just down the street from the Lincoln Mall. It sits in front of a strip mall, so you actually enter the parking lot down the street and come in behind the building. The Dispatch Sports Pub & Grill on Main Street in Lansing. Saturday nights are usually relaxed nights for us. After being lazy all afternoon and watching the NASCAR truck race, we decided to go out for dinner again. We still haven’t been to the grocery store since getting back to Michigan so there’s not a lot of food in the house yet and since shopping hungry is a bad idea, we just found a bar. Quite a while ago, someone suggested the Dispatch Sports Pub & Grill. 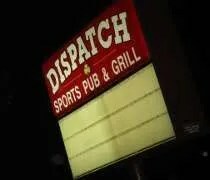 The Dispatch Sports Pub & Grill is on Main Street near I-496. It’s kind of out there by itself. There’s not a whole lot in the area yet the parking lot was packed even though it was a crappy, snowy night. We trekked through the snow only to be confused again. There were two doors. Neither were marked. Neither gave any indication that it was the entrance. One of them was a little fancier than the other so that’s the one I chose. I peeked in through the window and it looked right so we went in. Good thing I chose that one. The other one would have led to the kitchen. 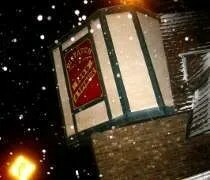 The inside is a typical sports pub. There are at least three pretty good size dining areas. The bar is the first thing you run into. From there, there are two dining areas off to the side. I took a second to look around and didn’t really see anything other than tables for large groups. Then I noticed some booths at the far end of the bar. The decor is all beer company freebies. It’s a comfortable, familiar setting. 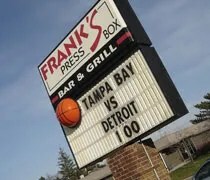 Frank's Press Box on Saginaw Highway in Lansing. Time for the weekly shopping trip. We got a little lazy today and slept in pretty late then had a hard time getting going, but we needed to run to Walmart and Horrocks to pick up just a few things before we head home for the Thanksgiving holiday. Both of us were starving when we left so we decided to eat first. Every time we go out that way, we go by Frank’s Press Box on Saginaw Highway. It always looks deserted, but we always go during the day during the week. When we pulled into the parking lot today (on a Sunday), the parking lot was the opposite of deserted. In fact, it was packed. The inside of the restaurant was no different. Most of the tables were full and all eyes were pointed at the TV’s. We figured out later the Lions game was blacked out and the only way to see it was to have the NFL package which Frank’s obviously did. 254 W. Grand River Ave. I first reviewed Crunchy’s back in the spring not long after moving to Mid-Michigan. 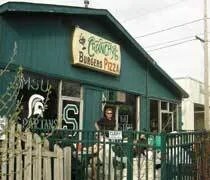 That was the beginning of my quest for the best burger in Lansing. 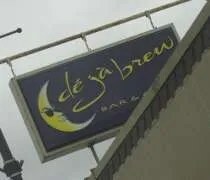 I wasn’t overly impressed, but really liked the bar. There were a few other things on the menu we were wanting to try and figured we’d get back there some day. Fast forward six months. I was working at Munn Ice Arena and J and I decided to meet up for dinner after the hockey game. There’s not a whole lot of options after 10:00 other than pizza so J suggested we meet at Crunchy’s.